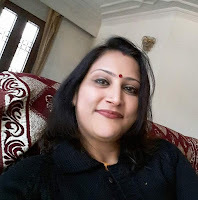 Madhumita Sinha is a corporate trainer by profession and a poet by passion She has published her first book of poetry ‘Heartbeats’ 72 random beats from My heart . She contributes her poetries in national and international literary journals across the globe besides publishing in magazines and newsletters in India . She loves to perform on her poetry. The poem brings in absolute newness while expressing the myriad true facets of life in a very lucid manner.